This project is by far one of my most favorite! That is because it’s all about the history. My grandparents purchased a twin bed and dresser set from a local furniture shop in Royal Oak, MI back in the early 1950’s. This set was to accommodate a growing family, which already consisted of two young boys and a third child on the way. The oldest of those boys was my father. 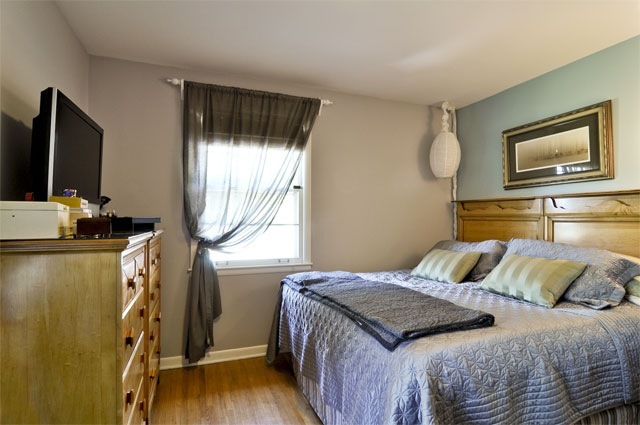 He and his brother shared a room and used those beds and dressers until they left the nest. 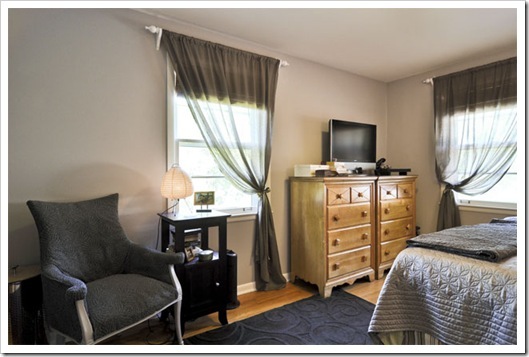 At that point there were three younger sisters taking up space in the compact five bedroom home my grandparents owned and in all their frugal nature they had two of the girls still employing those twin beds and dressers. Many years later when my brother and I had come along, and after the tragic lost of our first family home to a fire, those beds were pulled out of storage and passed on to my immediate family to be put in to use all over again. My brother and I had our own rooms, but the furniture in each space was exactly the same. Not until high school did I finally switch over to a full size bed, but I kept on using my dresser. 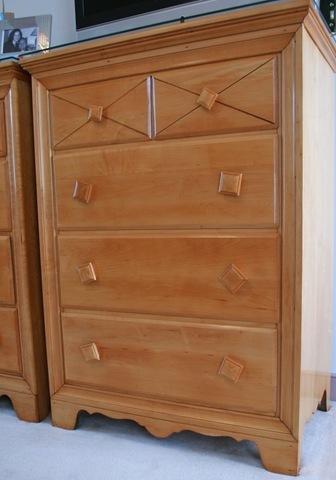 When I finally moved out on my own I took with me a bedroom set that I had scored at an estate sale. After sanding and painting the larger dresser and full sized bed frame, I took off with a bedroom set more fitting a young adult. (sort of, it was painted in bright pastels and looked like something straight out of Miami!) Before I could leave, my mom was dusting off the old twin bed so she could get it back into use in her newly found guest room. That bed set moved with her up to MI for a short stay and then later it was brought back down to TN after she returned to the south. 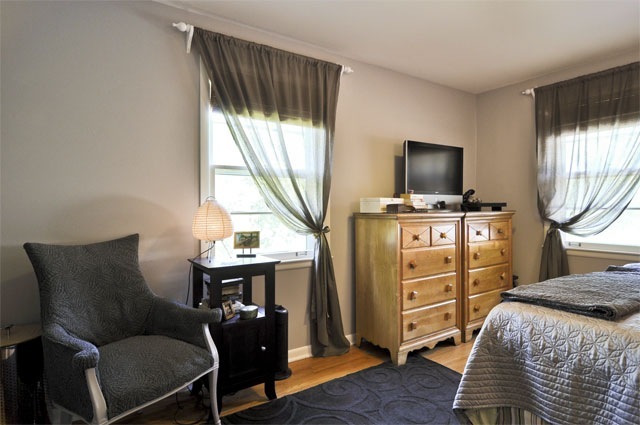 At about the same time, the Mister and I were looking for something to set up our own guest bedroom and mom offered up the now well-traveled family bedroom sets. We jumped at the opportunity to own a bit of family history until we saw the sad state of these pieces. Before coming back to TN, they had lived for several years in my grandfather’s old home. The same home that housed my college-aged cousin and an ever-changing group of college-aged boys. As you can imagine they put these pieces to the ultimate test and when they arrived in TN they were in pretty rough shape. Dirty, dusty, smelly, cracked, scratched, water ring stained….I wasn’t even sure I could bring them back from the depths of where they had gone. But, with no furniture refinishing experience (only painting over crummy wood) I jumped right in! Lucky for me we had a new home with a big garage and plenty of space for me to spread out the pieces and work to restore them. The first thing I did was strip down all the old varnish that was left on the head and foot boards, along with both dressers. Then I sanded out all the rough spots and did my best to take down any bad scratches. When I was finished with this step I had a lovely smooth surface to start with. Start?, you say. Yes, I had bigger plans for what these pieces were going to become. 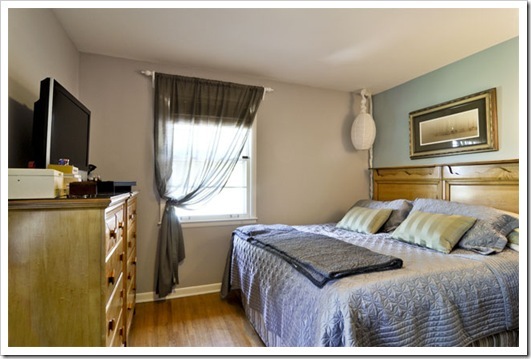 I wanted to use the bed in our master bedroom and since it was no longer the 1950’s, when couples used twin beds, I had some work to do. 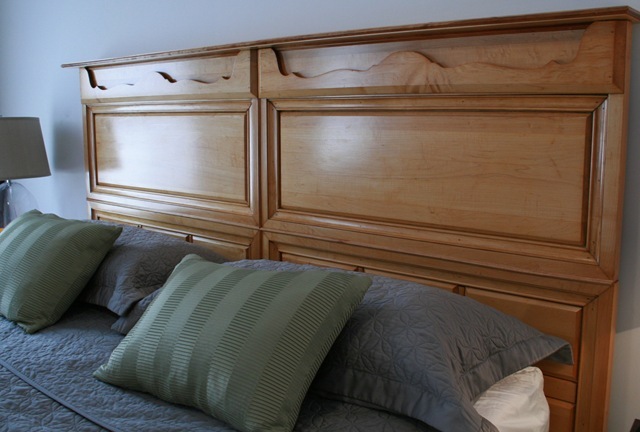 I planned to join the footboards to the headboards and then both of those combo pieces to each other, creating one large king sized headboard. After a lot of drilling, cutting and lining up of dowels, plus TONS of gluing I finally had a semi-finished piece. I then had to add trim pieces to mask, or “pretty up” the joints and close off the space behind what was the feet to the footboard before adding the top shelf piece. 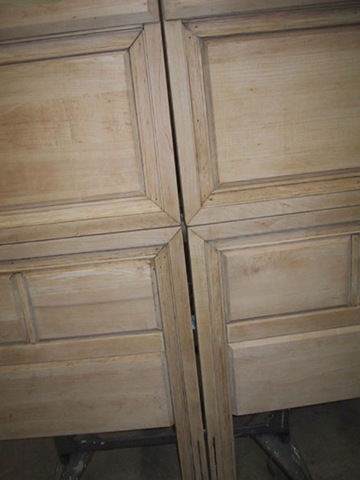 It took some time, the hardest of which was finding nice real wood trim in maple. Thank God for the few small lumber stores that still exist! Stripped down and ready for trim pieces. Another angle of the top before adding the shelf cap and backing trim. 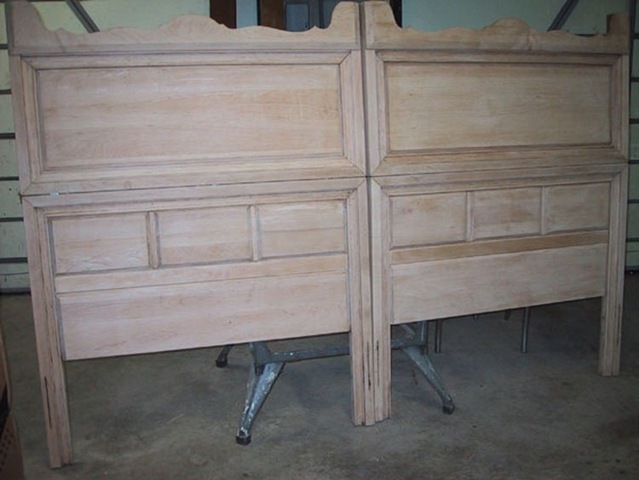 These were the feet of the original footboard. 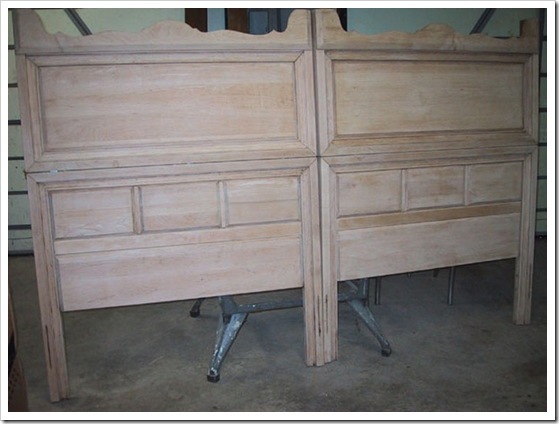 After completing the headboard, I coated all the pieces with many (to many to count!) coats of polyurethane. I lightly sanded with 120, and then 220, grit sandpaper in between coats and ended with a light rub down of lemon oil for a super soft, velvety finish. 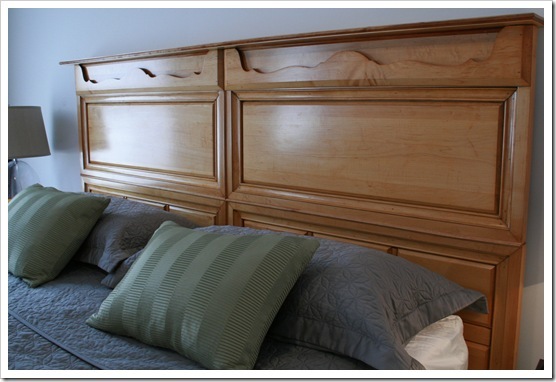 Our finished headboard in all it’s restored glory! For a glimpse of the pieces in a more finished space, here is the set in our bedroom at our TN home. We love how the pieces turned out and have been using them now for close to 5 years. 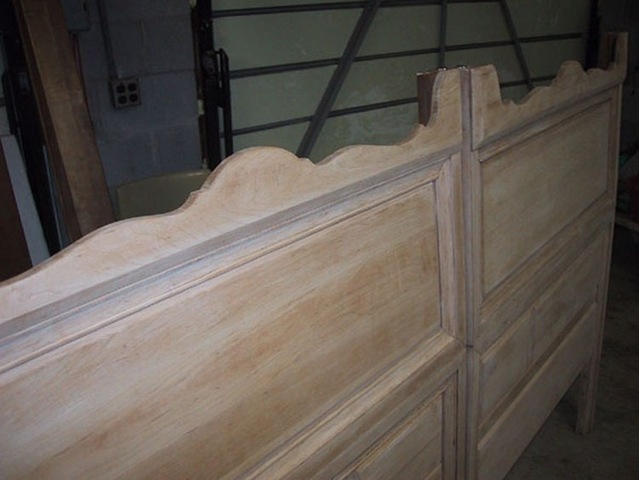 One day we may decide to switch out our massive headboard for something different and I have had thoughts of undoing all that I did to bring the pieces back to twin status in case my future children want to use them. But, for now, we will just enjoy our vintage bedroom set and all it’s fun history. 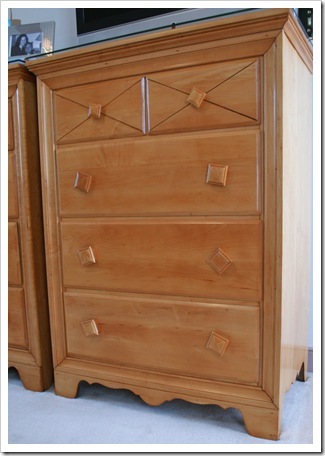 Do you have any furniture pieces with history in your home? 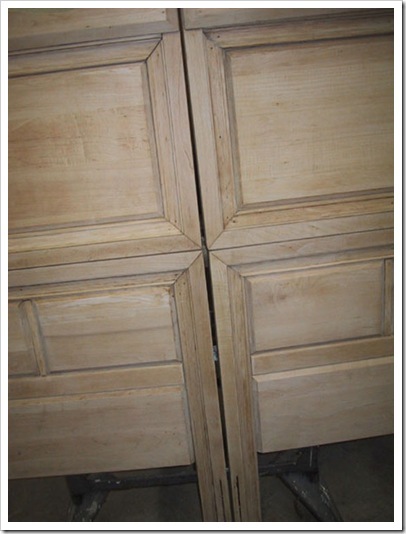 Have you refinished any furniture pieces or do you like to leave things “as is” so they can continue to tell their story? I have to show this to my daughter, this is such a great idea. 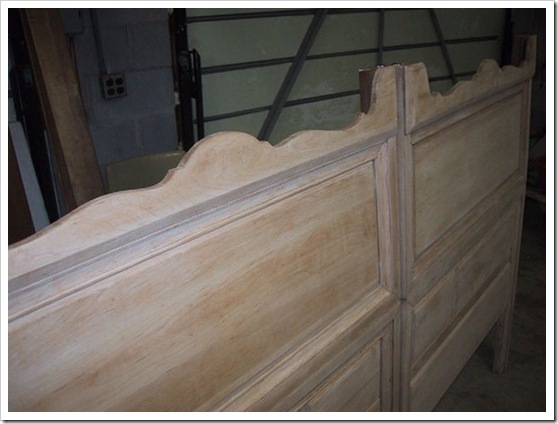 Lovely headboard! What a great furniture remake. Thanks Ladies! I appreciate it. Some time before, I really needed to buy a building for my organization but I did not earn enough money and could not buy anything. Thank God my mother proposed to take the www.lowest-rate-loans.com at reliable creditors. Hence, I acted that and was satisfied with my short term loan. Destle.com online psychics readers offers authentic psychic readings, free psychic readings with accurate online psychic readings. We have more experience psychic experts from USA, Canada, Uk, Germany and Indian Psychic Experts. Our free psychic readers have given advices on Love and Relationship, Money etc.